Yash Shirsath (Grayson High School salutatorian) enjoying the banquet with friends. 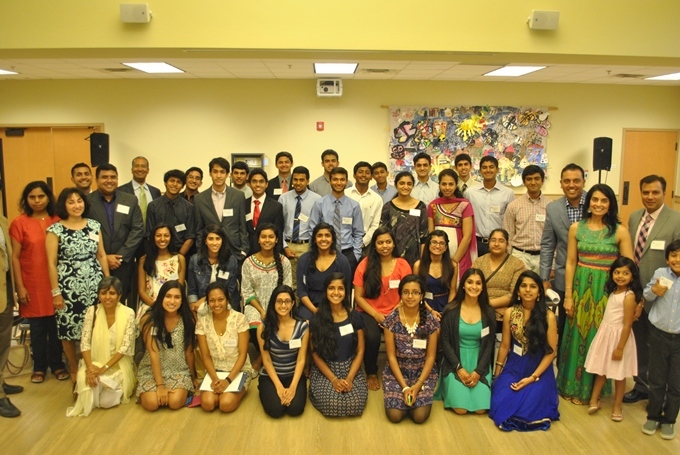 The Indian American Scholarship Fund (IASF) of India American Cultural Association (IACA) held its 23rd annual banquet at the Atlanta International School on May 31, 2015. The function highlighted the high school class of 2015; 26 college scholarships totaling over $35,000 were awarded. IASF is a nonprofit that obtains all of its funds from local donors and sponsors. All the money donated and collected is distributed to the students in educational materials and scholarships. This year’s class was very accomplished with 5 valedictorians, 5 salutatorians, and 29 students in the top 5% of their class. One student had a perfect SAT score of 2400, 2 students scored 2390 and 13 students were in the 99th percentile with a score of 2220 or higher. There were 9 National Merit finalists, 6 STAR students and 2 US Presidential scholar semifinalists. In terms of extra-curricular activities, there were 6 varsity athletes including two captains, 3 eagle scouts, 11 students excelled in orchestra and band, a Bausch and Lomb award winner, a Toshiba ExploraVision regional winner, a Samsung national mobile app competition winner, a semifinalist in the national Siemens competition, and 5 winners in the Intel science and engineering fair. 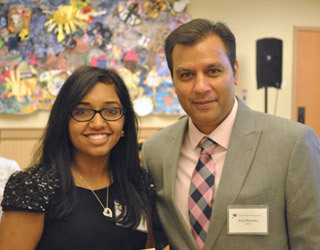 IASF chairman Dr. Anuj Manocha congratulates a student. The banquet began with an introduction by IASF chairman Dr. Anuj Manocha, who then introduced Mr. Ani Agnihotri, Chairman of the Board of IACA to talk about IACA events. Dr. Ravi Sarma, the founder of IASF, then addressed the class of 2015 and also gave valuable advice to the parents of the graduates. Mr. Agnihotri presented each member of the class of 2015 with a gift from IASF of a t-shirt and a book for college. Finally, the process of giving the scholarships began. This year 26 scholarships were awarded totaling over $35,000 including 4 four-year scholarships, 2 two-year scholarships and 9 one-year scholarships. The banquet highlighted the dedication to education and support of families with financial need. A “college room” was also available where current college students from Georgia Tech, University of Georgia, Emory, and Georgia State, led by Dr. Ritu Lohtia, answered questions and helped guide the current class of 2015. The spirit of community was evident throughout the function, and all of the members in attendance were so proud to see our future in the Class of 2015! For the organizing committee names, please see below. Chairman Anuj Manocha, Banquet Chairman Rajesh Kurup, Ibrez Bandukwala, Naveen Dittikavi, Sekhar Ghosh, Ritu Lohtia, Bindu Manocha, Sangeeta Mayur, Siva Mohan, Deepa Muralidhar, Geetha Paracharu, Rakhee Parikh, Shatul Parikh, Piyush Patel, Mathangi Ramesh, and Anu Whitaker.